O LORD you have searched me and known me. O LORD you know it completely. the night is as bright as the day, for the darkness is light to you. Though he is the patron saint of Ireland, Patrick was actually born in what is now Wales in the year 389. As a boy, Patrick was captured by Irish raiders and taken to Ireland as a slave. He spent six years serving as a shepherd in the lonely hills of the Emerald Isle. During this time, Patrick relied on his faith in Christ to encourage him and see him through his time of trial. One day in an act of bravery, Patrick escaped from his captivity and fled to freedom. After days on the run he managed to find a ship headed back to England and eventually, his home. As an adult, Patrick pursued priesthood and was consecrated a bishop. Surprisingly, after some time he felt called back to Ireland to minister to the people that once held him as a slave. Patrick bravely and freely spread Christianity all through the land where he was once held captive. One of the more famous legends about Saint Patrick is that of the Deer’s Cry. One Easter Eve in honor of Christ’s light conquering death and darkness, Patrick lit a bonfire on the hill of Slane. The controversy in this was that on this particular night no one was supposed to kindle any fire in Ireland until the high king lit his fire at the royal castle of Tara. Claiming Christ’s rule to be above any earthly king, Patrick courageously lit his blaze before the king’s fire glowed. Infuriated by Patrick’s actions, the king sent a group of men to kill Patrick and his companions. While Patrick and his friends went toward the men on their way to confront the king, they prayed a Lorica, or Breastplate prayer to God to protect them from evil and harm. When Patrick’s group passed by the men, all the king’s group saw were a herd of deer running by. Saint Patrick’s life is thus characterized by holding faith in God’s surrounding presence even in times of danger and trial. This trust in God’s ability to be his breastplate and shield allowed Patrick to have enough confidence to spread Christianity throughout the land peacefully and effectively. -What are some of the scary places you have had to walk through? -Could you feel God’s presence around you? -Remember a time when you had to do a brave thing. What gave you the courage to do it? Have fun with some activities that remind you of Saint Patrick. Wear Green! Pick (or make) a shamrock. Eat lamb’s stew or shepherd’s pie for dinner. Go outside and marvel at the light of the sun, the radiance of the moon, or the swiftness of the wind. Rejoice in God’s amazing creation and the hand of the Creator that surrounds and holds us all. 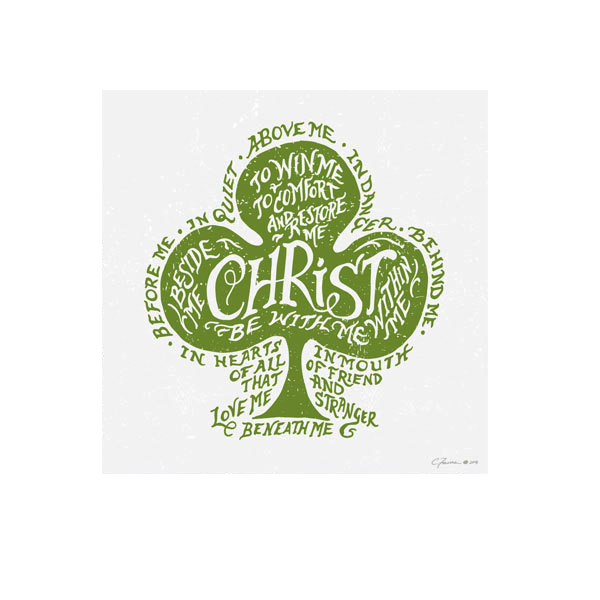 For a full reading of St Patrick’s Breastplate prayer (also known as the Lorica or Deer’s Cry) click here or here. Dena Douglas Hobbs is the author of Lighten the Darkness advent devotional and blogs weekly at Centering Down. She spent six happy years celebrating St. Patrick’s Day in her adopted hometown of Savannah, Georgia before she, her husband, and two children moved back to the Middle Georgia area. Tags: courage, nature, presence, St. Patrick. Bookmark the permalink.